This is the front side of the "Blue skirt". The glass object is made from Bullseye and Degussa opalescent glass. 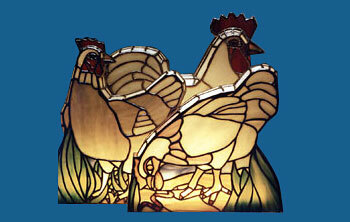 A rooster and two hens made from Degussa opalescent glass and some bulls eye glas. 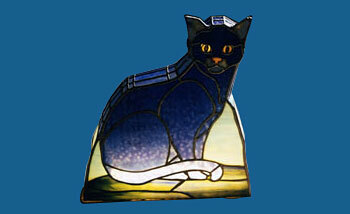 There are more than this shown combination of Tiffany lamp style glass objects. 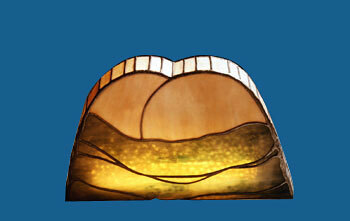 As they are only illuminated with a small 35 W longish bulb, no one will use this object as a reading light. It is more the sort of a beautiful room orientation in the dark. The middle hen is about 40x40x6 cm.